You are currently browsing the tag archive for the ‘habitat’ tag. The NSW Office of Environment & Heritage says, “In NSW more than 1000 native species, populations & ecological communities are threatened with extinction.” In Marrickville LGA we have remnants of Sydney Turpentine & Ironbark Forest, Swamp Oak Floodplain Forest, Sydney Sandstone & Sandstone Heath. The Marrickville Draft Biodiversity Action Plan identifies these as a priority for action to keep. Once the habitat goes, so do the animals, birds, reptiles, frogs & insects that inhabit it. In some areas species are hanging on by a thin thread. In Marrickville LGA we have the Green & Gold Frog, the Grey-headed Flying Fox, the East-coast Freetail Bat, the Eastern Bentwing Bat & the Long-nosed Bandicoot on the vulnerable or endangered list. With funding for the GreenWay being cut out in this week’s NSW Budget, the Bandicoot colonies will be at greater risk. Flying Foxes across Australia have become ‘Public Enemy Number 1’ because they are impacting humans more than ever in search of ever-dwindling food sources & habitat. Recently there have been incidents of poisoning local Fig trees, a major source of food for flying foxes. For bats, the future is not looking good. Also mentioned in the Marrickville Draft Biodiversity Strategy as threatened species for this area are the Red-crowned Toadlet, the Barking Owl, the Masked Owl, the Powerful Owl, the Sooty Owl, the Pied Oystercatcher, the Terek Sandpiper, the Swift Parrot, the Regent Honeyeater & the East-coast Freetail Bat. That’s a long list for an area of only 14 square kilometres. Looking at the map of ‘Threatened species, population & ecological communities around Marrickville LGA over the last decade’ in the Marrickville Draft Biodiversity Strategy, about 98% of sightings follow the GreenWay or near the GreenWay, the Cooks River & off to Wolli Creek. Council has the responsibility to plant street trees, parks & other areas with urban wildlife in mind. It is wonderful to see that they have prepared such in-depth reports about biodiversity in Marrickville LGA. Their action list gives me great hope in that there will be a future for urban wildlife & that areas of habitat will continue to be cared for & built upon, especially for those classified as vulnerable or worse. 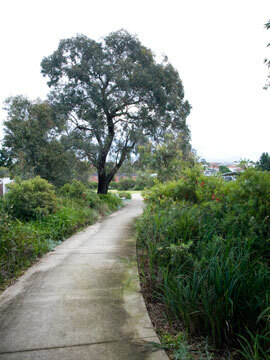 There are a number of events happening across the locality for National Biodiversity Month such as the Two Valley Trail Reconciliation Walk (see – http://bit.ly/oHDA0C ) & the Birds & Bush event (see – http://bit.ly/pirv0V ). 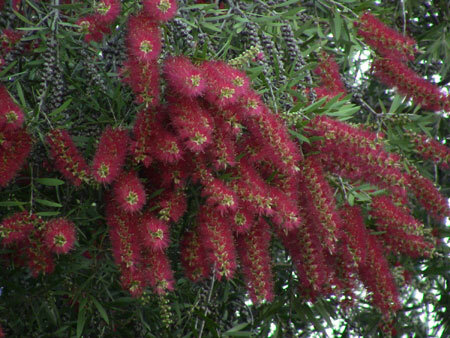 This is a close-up of one of a row of perfect Bottle Brush (Callistemon) trees just inside the perimeter of Ferncourt Public School in Marrickville South. Native trees in this condition are great for biodiversity because they offer lots of food for a range of animals, birds, butterflies, native bees & other insects. If only the thousands of Bottle Brush trees across Marrickville LGA were in such good condition. O’Dea Reserve has got to be one of the better parks in Marrickville LGA. I’ve heard it mentioned in Council meetings often enough so we decided to visit. The previous time we were there it was the site of an old & run down velodrome. I guess that repairing it was deemed too expensive so the velodrome was demolished & the area was made into a much-needed park. Marrickville Council has done exceptionally well here. 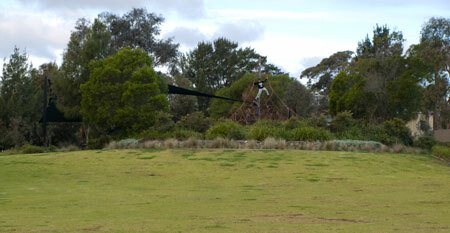 O’Dea Reserve has a large & well-equipped playground currently shaded by black shade cloth. Many Eucalypts have been planted around & close to the playground so they will create natural shade once they have grown. Perhaps then the shadecloth will be removed allowing the kids to play under the shade of the trees. Surrounding the playground are many soft & tactile plants allowing children to explore nature. This is much nicer than simple lawn. There is even a small hill made into the playground area allowing kids to roll & tumble on a padded rubber surface so they won’t hurt themselves. The playground was full of families with lots of children playing while we were there. There is also a large enclosed leash-free area for dogs to have a run & exercise. Like the playground, this area was full of people & their dogs. The dogs were having a great time & it was obvious that many knew each other & have regular meet ups there. Poo bags were available for free & there were bins for doggie poo. People cleaned up after their dogs as there were no surprise packages in the park. 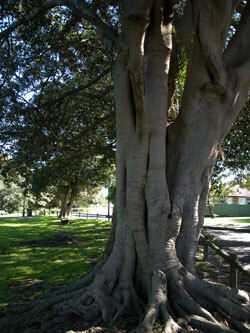 The park has an incredibly healthy & good-looking Fig tree that should be included in the Significant Tree Register. It is definitely a tree that one hopes future generations will also benefit from. Council has protected this tree & prevented soil impaction from people walking around the base of the tree by building a very large raised deck around the trunk & under the canopy. This area could be used for all sorts of community meet ups & is a natural & perfect stage for music. Perhaps we too should have evening plays like the community in Glebe who has ‘Shakespeare in the Park’ every summer. It would be easy to ignore the fence railings just to be able to have this experience. There is a vast lawn in front & beside the deck on both sides that would allow a thousand people to sit on picnic blankets & watch the play. Perhaps Council could go crazy & put on Moonlight Cinema for a few weekends over summer. Now wouldn’t that be a great idea. Another large tree at the bottom corner of this park also has a large deck built around it. There is also a gabion wall beside this that forms a boundary to the park. As this is at the end of street, both the tree & the wall look very striking in the streetscape. 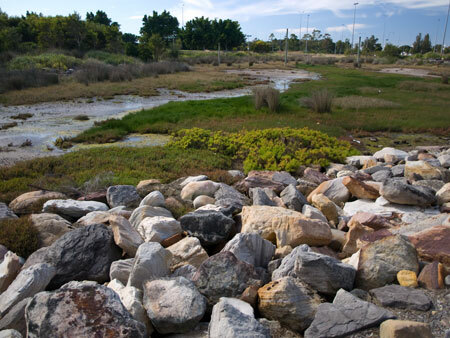 Gabion walls have been successfully used elsewhere in the park to create levels for landscaping. They look great & offer terrific habitat for small animals & lizards. O’Dea Reserve has been divided into ‘rooms.’ Its not a park with trees around the periphery & lawn in the centre. There are still vast areas of lawn, but these have been divided into areas of significant landscaping. The landscaping does include the usual & familiar grasses that define this LGA, but also plants & small trees, such as small Bottle Brush, various Grevillea, Banksias & others, all bird-feeding Australian native plants. Sizable corridors have been created that offer real habitat for small animals. These are dense so the dogs naturally don’t try to enter. Small birds have lots of food & are well protected. Quite a number of larger growing trees have been planted throughout the park. In 10 to 20-years time these should have reached a decent size, adding more visual beauty & hopefully shade to the park. At the moment shade is the only thing lacking as one would need to find somewhere that does have shade. Concrete paths meander around the landscaped areas. Kids whizz by on scooters, people stroll & there are cyclists as well as joggers. Park benches are dotted all over the park & also in the playground & the dog exercise area. Benches are placed where there will be shade at a certain time of day & all are placed to look at a view. O’Dea Reserve is a park set up for people & as such is a surprisingly useful area of green space. There are 2 large barbeques & an area of undercover seating with picnic tables providing shade for those who use these facilities. In front is a large concreted area that has a design incorporated into it. This is a safe area for little children to play whilst still being close to their family & the playground is not too far away. We saw many birds, including Galahs feeding peacefully on the grass. The park is clean & there is very little graffiti tagging in the park itself. It’s a truly lovely park & proves that Marrickville Council can do what I bang on about in this blog. It was so nice to see. If Council can just do what they have done in O’Dea Reserve in the other parks across the LGA, our experience of parks will be much better & Council may find that the community uses them more. Also, our parks would fulfill the role of much-needed restaurants for urban wildlife, which would be a very good thing. Well-done Marrickville Council. We loved O’Dea Reserve. If you haven’t been this park is well worth a visit. I’m keen on hedges & hedgerows. I think they not only look great, but with the right kind of hedge, you can create food sources & safety for birds, especially small birds. Hedges are also good for other urban wildlife & help improve & foster biodiversity by providing habitat. Hedges & hedgerows also add beauty & make an area look neat & cared for. They fill up places where litter would collect. There are many places across Marrickville LGA where hedgerows could be used to hide the areas that don’t look good, especially along the railway lines. In this situation they would act as a noise & wind buffer, also reducing dust. 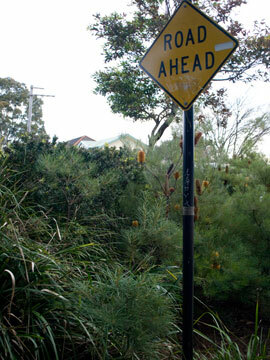 Small native flowering hedges could be used along sections of the verges around Marrickville LGA. Surely this would be cheaper to manage than the current $2.2 million Marrickville Council spends on mowing. 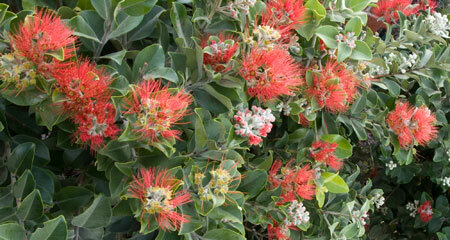 There are plenty of small growing natives that would be soft enough so as not to cause injury. Not all hedges need to be pruned into the usual shape. If they are planted next to a cyclone fence for example, they can be pruned once or twice a year just to get any errant branches out of the way & prevent them from growing too tall. The more room, the easier it is to allow them to grow into a more natural shape. It’s a case of choosing the right species & planting the hedgerow in the right place, just like trees. Rockdale Council is using New Zealand Christmas trees very successfully as hedging along waterfront pedestrian walkways in Sandringham. They look stunning & Rockdale Council obviously doesn’t think hedges are too hard to manage. These flower in winter so there were great big red flowers at eye-level & lower bringing colour into the area. Rockdale Council didn’t need to plant hedges here. They could have relied on the fencing of the properties. Instead they took control of the visual amenity allowing whatever people wanted to do with their own fencing to be hidden behind a flowering hedge. Many have chosen to hedge as well. Australia has 62 wetlands listed as internationally significant under the Ramsar Convention. There are 1,911 other listed wetland sites around the world. The East Asian-Australasian Flyway travels from the Arctic to China, South Korea, Japan, Malaysia, Indonesia, Singapore & down to Australia. Birds migrate annually up & down this flyway stopping at wetlands along the route. Unfortunately many of the wetlands along the East Asian-Australasian Flyway are being destroyed by urbanization. 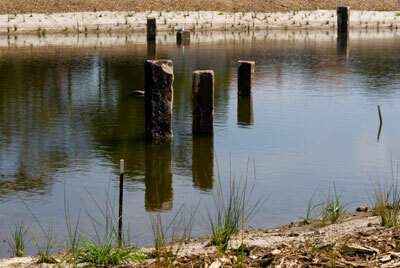 Wetlands are being reclaimed for housing, for farming & many are being drained to irrigate farming land. Also, many of the trees in the wetlands are being chopped down to make charcoal. Consequently bird numbers are declining, in some cases dramatically. Hunting & watersports are also a big problem for the birds. Experts agree there is a need for well-managed bird sanctuaries along the migratory flyways where hunting is prohibited & watersports are limited & controlled. Near Threatened or Least Concern. This tree news is a month old. I wrote the post, but didn’t put it up as there were other issues I was more interested in at the time. It’s still relevant. 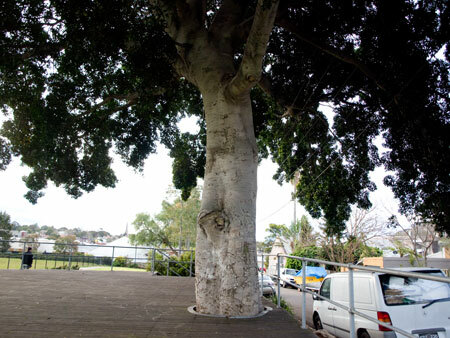 Northern NSW mounted a campaign demanding that Tweed Shire Council overhaul their tree protection laws to save a 114-year-old commemorative White Fig tree. The Fig located in the grounds of Chinderah Tavern lost a major limb. Kingscliff arborist Brett Hamlin was the first to prevent the removal of the tree by staging a ‘sit-in’ until other residents arrived to take over the fight. “Tweed councillor Katie Milne said the tree, which stood on private property, should be protected by council rules or listed on a significant tree register, but was not. ‘The council has resisted all past attempts at adopting some heritage controls which could protect important trees like this one,’ she said. 3. A road called Peninsula Link on an environmentally sensitive Westfield property in Frankston South of Melbourne in Victoria has angered locals who are protesting the removal of trees & native bushland that provides habitat to endangered animals. A picket line has been happening for the past 6 weeks preventing work starting. http://frankston-leader.whereilive.com.au/news/story/peninsula-link-protest-escalates/ There are 4 other articles providing a history of the protest. It’s the time of festivals for Marrickville LGA with the Greenway Festival happening from this Sunday 10th – 17th October 2010. There will be 23 free events during the Festival week happening at Newtown, Stanmore, Marrickville, Dulwich Hill, Sydenham, Summer Hill, Leichhardt, Haberfield & Hurlstone Park, so there should be something of interest happening close to you. 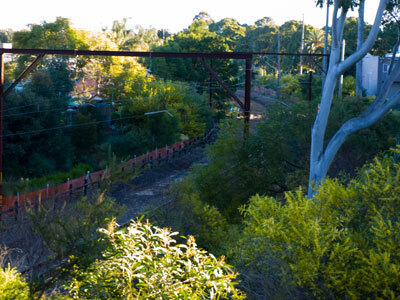 The GreenWay is a long strip of land along the goods line rail corridor & the Hawthorn Canal connecting the Cooks River to Iron Cove at Haberfield. It is a precious area of habitat for urban wildlife, including the endangered Long-nosed Bandicoot, birds, flying foxes, possums & frogs, lizards & a range of insects. The Greenway is cared for by volunteers & is always looking for new members who want to join others in bush regeneration works. Today was the grand opening of the Cup & Saucer Creek Wetland in Canterbury. We missed the official opening & the speeches, but apparently a good crowd of more than 100 people attended. 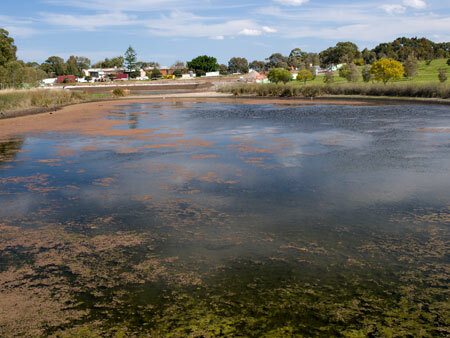 Sydney Water in co-operation with Canterbury Council have done something very special by creating a wetland from scratch. Despite its pretty name Cup & Saucer Creek is a concrete drain. 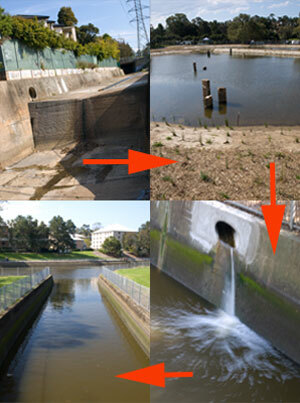 It leads directly into the Cooks River taking with it anything & everything picked up in the local stormwater drains. With the new wetland system, stormwater that comes down Cup & Saucer Creek gets diverted by a weir & taken into the first of 3 ponds. Plants filter the water before it flows into 2 smaller ponds. From these ponds, the water filters through the ground into the Cooks River or when it is really full, enters the lower end of Cup & Saucer Creek through an overflow system & then into the Cooks River. 30,000 plants (grasses & shrubs) have already been planted in the heavily mulched area with a further 10,000 water plants to be planted in the ponds soon. Around 30 Eucalypts, Turpentine & Angophoras have also been planted. Let’s hope they all survive. One thing about Canterbury Council that I like is that they do plant trees species that grow large & they don’t only rely on Casuarinas with a terrific selection of large trees along their section of the Cooks River parklands. They also put down permeable paths. The only bit of cement I could see on the whole site was a little bit used to cement the sandstone seats together. Elements such as sandstone blocks sticking out from the pond water appear Zen-like, but actually were installed for birds to perch & for the Sydney Long-necked Turtle to bask in the sun. I didn’t know the Cooks River had turtles. Apparently the turtles have trouble getting out of some sections of the river because of the steel & wooden purpose-built banks. So, this area will provide a safe habitat for them. Frogs, birds & other animals/insects will also benefit. It’s like high-class housing for urban wildlife. Right now the wetland is in its infancy, but it still looks beautiful. In 3-6 months time it will look very different as the grass & the plants will have grown. In 2 years it will look stunning. Stream Watch will be collecting samples first from Cup & Saucer Creek & then from the end process of filtration to check on water quality & the efficiency of the wetlands. It will not only be a fantastic natural intervention to clean up stormwater pollution before it enters the Cooks River, but it will also do much to improve the water-quality of the river itself. 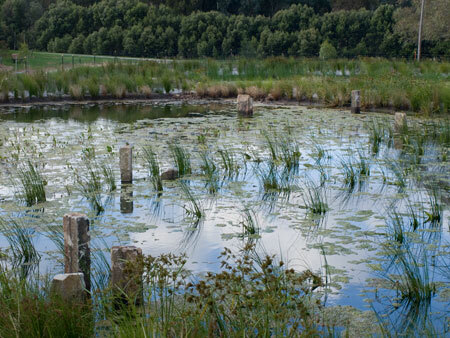 Imagine if all the councils along the Cooks River created wetlands like these. In time the river would become swimmable & that would be a great gift to leave our grandchildren & the urban wildlife of the future. A pelican was sunning on a sandbar in the river while we were there & everyone admired him. trees that provide food for birds & other native animals. This post is about the Grevillea, an Australian native. They are sometimes spelt Grevilliea. 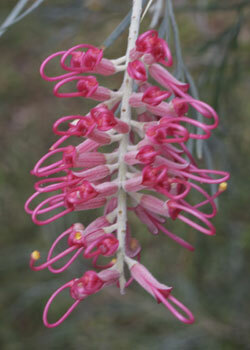 There are about 360 varieties of Grevilleas. They range from ground covers to tallish trees. I’m no expert & others may say something different, but I think if you want birds into your garden quick smart, plant a Grevillea or 2 or 5. Grevilleas are fast growing, look lovely, respond well to pruning by producing more flowers so they can be kept neat if that is a concern. Many varieties flower for most of the year with peak periods in both winter & summer months. The flowers of Grevilleas range from vibrant pinks, reds & oranges to subtle creams & yellows, so if you have a colour scheme in your garden, you can choose to suit. The flowers themselves can be as tiny as a finger nail or 10 cm or longer & most are long lasting. 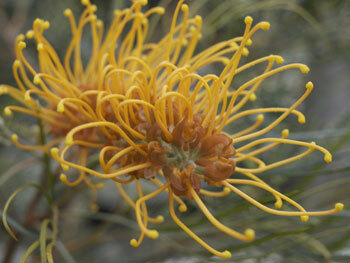 One Grevillea shrub or small tree can have a hundred or more flowers during the peak flowering period. Because their roots are shallow they are not invasive to pipes, nor will they uplift cement or disturb kerbing. They do not like having their roots disturbed & if this happens, they are likely to drop dead on you. 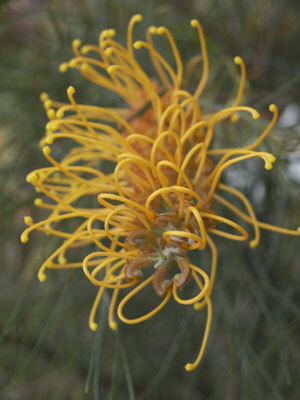 I have not been able to successfully transplant a Grevillea & would recommend you choose your site well. Because their roots are shallow, they appreciate a cover of mulch to protect their roots from drying out. Smaller Grevilleas are excellent in troughs & roof gardens where there is not too much soil. They grow well in all sorts of soils, including sandy soils, but don’t like to be too wet. They prefer an acidic soil in full sun. They are a great plant for low water requirements. Bankstown City Council are running a program to bring the birds back by encouraging residents to plant bird-feeding plants. Grevilleas are one of those recommended. 230 different species of birds have been sighted in the Bankstown LGA. 16 of these are listed as endangered or vulnerable species in NSW, which is very sad. Once these birds are gone, they are gone forever. Pittwater Council has also decided that all properties should have an area at the back that is less cultivated & includes a variety of native plants to provide food sources & habitat for urban wildlife. They also recommend not removing dead trees & leaving hollow logs to provide homes. There is no reason why we cannot do something similar, if modified somewhat to suit the higher density in some areas of Marrickville LGA. However, many of our gardens have sufficient space for planting many trees & shrubs. One of my neighbours transformed their ¼ acre block from a lawn with a lemon tree to a spectacular haven for wildlife. They used a mix of exotics & natives to stunning effect. Grevilleas make excellent trees or shrubs for small front gardens. 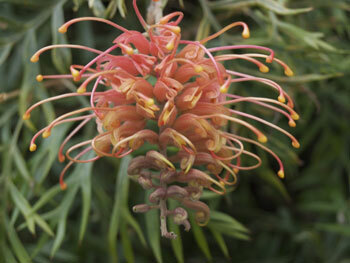 Many Grevilleas are hybrids now, which also ensures they grow well & flower prolifically. Grevilleas from Western Australia don’t do well on the east coast & visa-versa unless they are a hybrid. Nurseries tend to stock plants that suit the local area, so unsuitability is rarely an issue. I have read that hybrid Grevilleas are not so good for the birds as they are not used to having so much food. I admit to ignoring this in an inner city environment, as I truly believe there is a shortage of food for wildlife rather than a glut. They are competing with cement & plants that do not provide food. I highly doubt they will have obesity problems if we provide some more food sources for them. I had suspected that possums eat Grevillea flowers & a Google search has confirmed my suspicion. Those who read this blog may remember that I have mentioned that a baby Ring-Tail Possum moved into a nearby street tree last year. Well, of course he/she would. There are palm seeds & Grevillea flowers galore at our place so he/she is probably stuffed. The good news is there is no damage, no poo, & all our gardens are left alone. Even the ice-berg roses (which possums apparently adore) in a front garden are untouched, proving that if there is sufficient food, the exotics are left alone. There is only one small problem with Grevilleas that I am aware of. Some people find the foliage irritating & bare skin contact with them makes their skin itchy. This is something to take into consideration if you have small children. Basically, if you plant a Grevillea, the birds will come & this can only be a good thing. The Inner West Courier published a letter of mine about the revised plans for Mackey Park. If you are interested in reading it, click on the Media page in the left-hand column, which will take you to the link. In other news, Bush Pockets is building a swathe this Saturday morning in Marrickville & would love help from anyone who wishes to volunteer for an hour or 2. For details about Bush Pockets & contact information, go to the What’s On page on the left-hand column. SOT doesn’t campaign to save trees on private property (unless it is a significant issue which clearly affects the community), but today I feel the need to make mention of an old & beautiful Coral tree in Newtown which met its death today. It’s the usual reason. A resident complains to Council & says the tree is causing damage to pipes or property, so the tree has to go & the community has lost 1 more large tree. I mention this because I want to share parts of a letter that was sent to me regarding this tree. I think that this small excerpt conveys the distress that people feel when a tree is chopped down. It also eloquently highlights how many birds & animals rely on this tree. “So now we lose a beautiful tree because someone ‘doesn’t like it’, doesn’t like the mess it makes, doesn’t like the fact that it ‘get’s in the way,’ disturbs the plumbing, costs money & is wrongly accused of being ‘dangerous’. 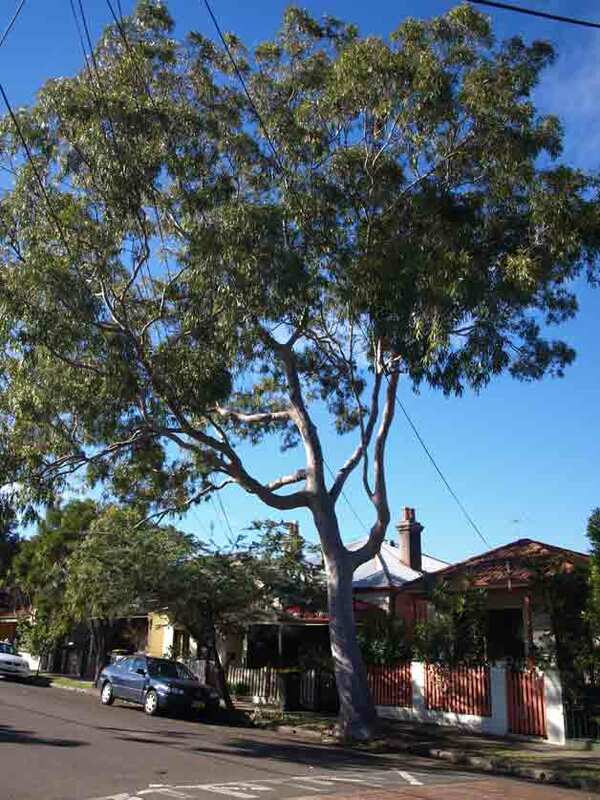 The street tree outside 11 Union Street Dulwich Hill is the subject of further monitoring. You may have noticed a yellow paint mark on the trunk – we are surveying the tree to determine if it undergoing any increase in lean away from the vertical. We will continue to monitor the tree until we have a clearer idea of what it is doing. We will put something on the website about this. This is terrific news & I thank Marrickville Council for taking the conservative approach to monitor rather than simply remove this beautiful tree. This tree was the first campaign of Saving Our Trees, so it shows that community input does influence Council. Thanks also to all of you who made submissions to Council asking the tree be retained. It is because of you that it is still standing. Considering the positive impact of large street trees on property values, I imagine many of the nearby residents are pleased that it has not been removed as well. Using and copying text and photographs is not permitted without my permission.